More of your customers are paying with a credit or debit card. Save more on every transaction. TransFirst has earned the trust of more than 7,000 NFIB members nationwide to manage their transactions securely and reliably. 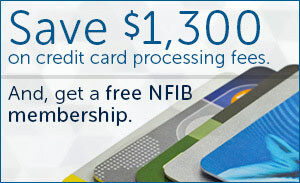 NFIB members saved an average of $1,300 annually.. Call (800) 619-5301 or fax your last merchant statement to 866-744-6492 for the free savings analysis‡ and membership offer. NFIB Member Benefits are offered by third parties through contractual arrangements with the NFIB Member Services Corporation, a wholly-owned subsidiary of NFIB, or one of its affiliated agencies. Neither NFIB nor any of its subsidiaries or affiliated agencies is providing any products or services to you and they shall not be responsible for any claims or losses relating to the use of the NFIB Member Benefits. *Must be new TransFirst customer and new NFIB member. †Represents average annual savings found for NFIB members that switched to TransFirst in 2012. **Merchants eligible to accept American Express Cards directly through TransFirst are those that process less than $1,000,000 in American Express annual charge volume. Certain restrictions and exclusions may apply. ‡Pricing comparison applies to standard card organization fees only, not to include monthly terminal or software fees. Merchants must provide their 3 most recent monthly merchant processing statements. All accounts subject to credit approval. Offer expires MONTH DAY, 2014. TransFirst, LLC is a registered ISO/MSP of: Wells Fargo Bank, N.A., Walnut Creek, CA and Synovus Bank, Columbus, GA for Visa® and MasterCard® transactions only.